Maps illustrate the geography of elections, whether a single election or a series of elections.Since its inception in 2000, “The Rhodes Cook Letter” has been following U.S. elections for president, Congress, and governorships, as well as providing analysis of voting trends that these elections produce. In both presidential and midterm election cycles, the Letter takes a close look at primary contests as well as the November balloting, with an interest in placing both primary and general election results in historical context. This is done with the help of various forms of charts and artwork presented in living Technicolor. They are designed to illustrate in a straightforward and colorful fashion, the basic points that are being made in each issue. Maps, line graphs, and bar graphs, in particular, are featured. From 2000 through 2016, the Letter was published on a bimonthly basis, with a total of six issues per year. Since 2018, the Letter has moved to a four times a year publishing schedule, with the first issue of 2019 to be released in April. Unlike in the past, when the Letter was sold only on an annual subscription basis, there are now two options. The first is to purchase four issues, which would cover a year’s worth. The other option is a new one: to buy the Letter on an issue by issue basis. With either option, payment can be made by cash, check, or now through PayPal. In any event, thanks for your interest in the Letter. The 2020 presidential election may still be more than a year and a half away, but there are basic elements about it that are already known. Much as the 2004 election was a referendum on the policies of President George W. Bush, the 2020 election will largely be a vote on Donald Trump and his presidency. As such, the race will be expensive. It will be bruising. And it will be for very high stakes. 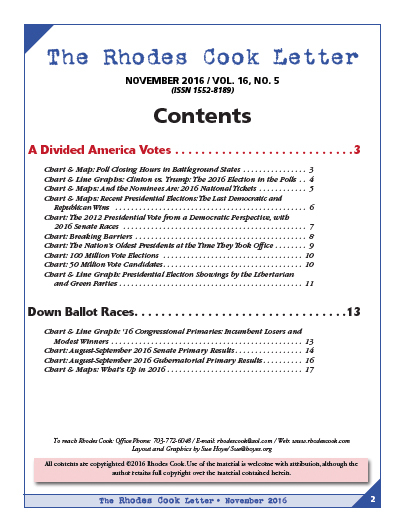 The April issue looks at the pros and cons for both major parties at this early stage of the 2020 campaign, with charts and artwork galore. 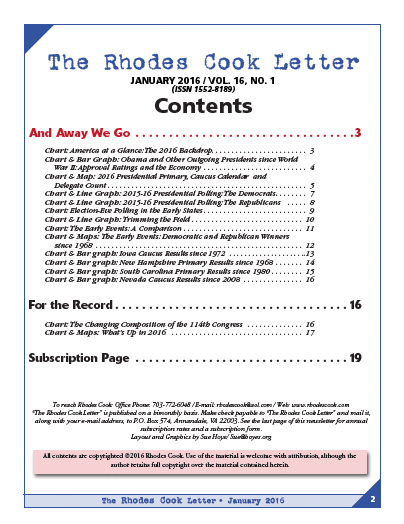 Following is a list of issues of “The Rhodes Cook Letter” published since the beginning of 2016, with a brief description of each. Electronic copies of all past newsletters sell for $10 per issue; printed copies for $15 per issue. 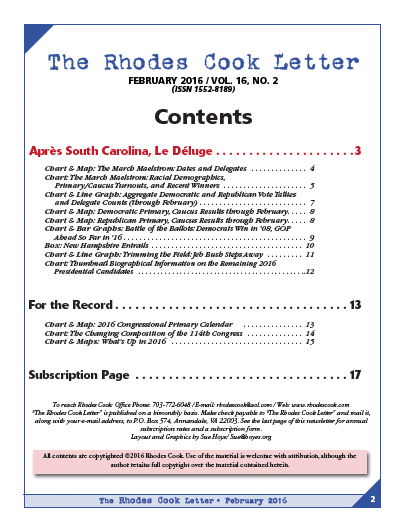 For a list of the titles and dates of newsletters published from the inception of “The Rhodes Cook Letter” in 2000 through 2015, please contact rhodescook@aol.com. Line graphs are used to illustrate electoral trends, whether comparative poll data as above or electoral data. A preview of the 2016 presidential nominating contests, especially the four states that kicked off the voting in February (Iowa, New Hampshire, Nevada, and South Carolina). A look at the results of the opening events in February dominated by Hillary Clinton on the Democratic side and Donald Trump on the Republican. Also, a look ahead at the glut of March primaries. 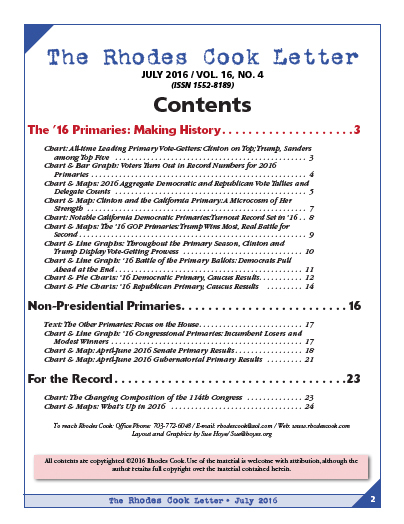 A detailed review of presidential primary and caucus results in both parties through March, and an opening look at 2016 congressional primary action. Final thoughts (and numbers) on the 2016 presidential primary season, plus results from the spring congressional primaries. Bar graphs often compare various aspects of political data at a particular point in time, such as the standing of presidents at a similar date in their administrations. Emphatically “no” was the answer to the question posed in this issue. While Donald Trump looked unelectable to many political observers through the summer and fall of 2016, both major party candidates possessed clear strengths and weaknesses which made the race competitive to the end. An election eve preview of the November 2016 balloting, with information on state polling hours, final polling numbers, and data putting the presidential election into historical context. A first take on the stunning 2016 election results, with a focus on Donald Trump’s surprise victory in the presidential vote. The unexpected outcome was the product of a historical rarity: An Electoral College “misfire,” with different popular and electoral vote winners. It was only the fifth time in the nation’s history there was a “misfire,” but 2016 marked the second time it has happened since 2000.